This is a plugin that synchronizes some of the data stored in the Polar files with the data in SportTracks. It is primarily intended to simplify migration from Polar Pro Trainer to SportTracks, rather than for ongoing dual usage. This plugin will not synchronize the exercise information that is stored in the .hrm files; you should import the .hrm files using the standard SportTracks import. The plugin looks for the Polar file that contains the person information. This is a Polar Person Data (PPD) file. Update the SportTracks activity with the category information, mileage, calories. One of the primary purposes of this plugin is to set the SportTracks Activity Categories based on the Polar information. 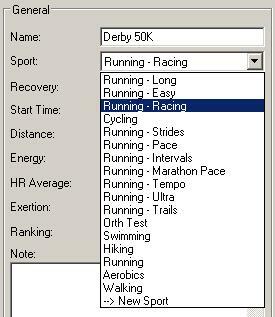 Polar has a simple string that is the exercise type, but SportTracks has a hierarchy of categories. The plugin will look for delimiters in the Polar activity name, such as hyphen, comma, period, and assume that the sub-parts of the names from a category hierarchy. So if the name is "Running - Intervals", the plugin will look for the category "Intervals" under "Running", which should be under "My Activities". Here is a screen shot of the list of sports I have in Polar ProTrainer. I have a number of sports starting with "Running", then a hyphen and a subtype of running. I manually created a hierarchy of categories under "My Activities", with "Running" and under "Running" I added "Trails", "Long", etc. 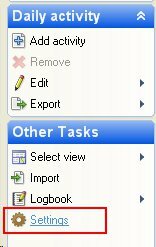 Backup the SportTracks logbook. This should be under 'My Documents' , ending in '.logbook3'. The plugin will attempt to guess which person to import. If it finds possible .ppd file, it will prompt you to use the discovered file. If no .ppd files can be discovered automatically, or you decline all of the guesses, a file selection dialog will allow you to select your .ppd file. This file should be under the Polar installation folder. In the folder with the PPD file there should be a subfolder for each year you have exercise data. The plugin will parse the PPD file and check there is a SportsTrack activity category for each category in Polar ProTrainer. The plugin will look for all exercises (PDD files) in any subdirectories of the location the PPD file was found. If there are any duplicate exercises in SportsTracks, the plugin will warn about them. A duplicate is defined as sharing the same start date and time. If the plugin cannot find any activities for the PDD files, it will warn you at the end. Currently the plugin will only update the activity category, name, calories and distance. Other data could be synchronized, but this is not yet supported. Don't look for "My Activities", but use the first category in the list. Different languages have different names, causing problems.